Wes and Corey are all set for another boring summer at music band camp when they run into free-spirited singer Ash and have a totally inspired monster jam session. They decide that the three of them mesh so well together that rather than waste their time at camp, they should take their new act to the road. Because gigging across America is the only way to truly refine your musical chops. Their road trip is not without some hilarious drama. I read this book while we were camping and I distinctly remember being in my sleeping bag with a flashlight because I couldn't put it down. I also remember trying not to giggle and wake my kids up. 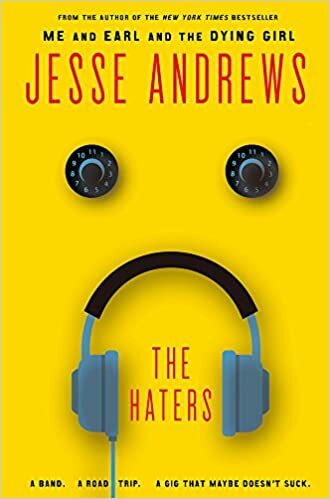 The Haters was an enjoyable coming-of-age book and is sure to delight music fans, as well as kids who just want a regular realistic funny non-dystopian read.